In Band III, the ambient noise spectrum flattens out and the noise appears to be dominated by distant shipping traffic. Band IV contains the Knudsen spectra (Knudsen etal., 1948) having a slope of —5 to —6 dB octave-1 (about —17 dB decade-1) in which the noise originates at the sea surface near the point of measurement. 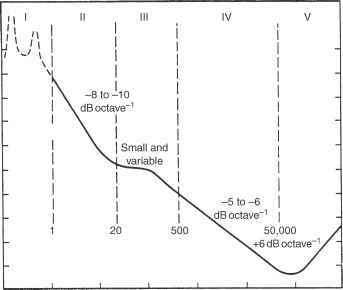 Band V is dominated by thermal noise originating in the molecular motion of the sea and is uniquely characterized by a positive spectrum having a slope of +6 dB octave-1.